“I have a prepared a note in respect of the report of the commissioner of intelligence of the state of Maharashtra which requires immediate consideration. The report is a bundle of contradictions. We pray that the report be brought on record by way of affidavit so that we can initiate proceedings under section 340 Cr. P. C.”. Elaborating on the discrepancies in the report, Mr. Dave advanced, “When Loya allegedly had a heart attack, none of the four judicial officers whose statements have been produced were with him. There was only a person named Dr. Prashant Rathi who claims Loya had called him. He was taken to the Dande Hospital in Nagpur, from where he was shifted to the Meditrina Hospital. The police report dated December 1, 2014 or any other document does not mention the presence of any other judicial officer”. At this point, Senior Counsel Mukul Rohatgi, representing the government of Maharashtra, intervened, “False! Loya had stayed at a room in the Ravi Bhavan in Nagpur with 2 other judges. He had called deputy Registrar Rupesh Rathi and was taken to the Dande Hospital, wherefrom he was being taken to the Meditrina hospital but died on the way”. Continuing, he said, “For 2 years after the death, nothing was done. Then suddenly an article appeared in the caravan. Thereafter the Chief Justice of the Bombay High Court directed the DGP to conduct a discreet inquiry. He spoke to the four judicial officers who stated that they had stayed at the government guesthouse with Loya and that the deputy Registrar had been called”. “Let us have a bird’s eye view of our the case so that we can understand which documents are already on record and which need to be filed”, said Justice Chandrachud. Mr. Dave proceeded to make his submissions based on the earlier mentioned note prepared by him- “In 2010 in the case of Rubabbuddin Sheikh v. State of Gujarat, the Supreme Court had ordered that investigation be conducted nit by the local Gujarat police but by the CBI as ‘justice is not only done but also seen to be done’. Thereafter, on September 27, 2012, the apex court had mandated that the trial in the case be shifted from Gujarat to Maharashtra, stating that it was ‘convinced that in order to preserve the integrity of the trial it is necessary to shift it outside the State’. The Supreme Court had also ordered that the trial be heard by the same judge from start to finish”. Criticising the administrative order of the High Court transferring JT Utpat, the judge who first heard the trial, and replacing him by Loya, Mr. Dave said, “On June 6, 2014, Utpat had rebuked Amit Shah for seeking exemption from appearing in court. Thereafter, he was given marching orders; he was asked to move to Pune forthwith. It is suspicious. On October 31, 2014, Loya, who had allowed Shah the exemption, asked why Shah had failed to appear in court despite being in Mumbai on that date. Finally, Loya died on December 1, 2014”. “In a matter involving the killings of three persons, an application under section 227 Cr. P. C. is not admissible”, he commented. “Are we talking Loya’s death or an order of the High Court transferring a judge”, asked Mr. Rohatgi rhetorically. “We have made the High Court party to our petition”, replied Mr. Dave. Continuing, Mr. Dave said, “On November 23, 2017, the Home Secretary directed inquiry. On the same day the Commissioner of Intelligence, in his letter addressed to the High Court, mentioned about the four judicial officers. How could have possibly known at that time? Within 5 days, the report was submitted to the Chief Justice on November 28, 2017”. “Letters of the four judges sound parrot like. The Chief Justice and the Registrar were in the adjoining guesthouse. Why did they not call Loya’s wife and family? Why did they not take him to the best hospital? Rathi’s statement was recorded at 8:33 AM and the death happened at 6:15 AM. But there is nothing in the statement about the presence of any other person”, Mr. Dave submitted. Elaborating on the contradictions in the statement dated December 1, he advanced, “The statement was recorded at PS Sitabuldi. There has been a falsification of records by the police. 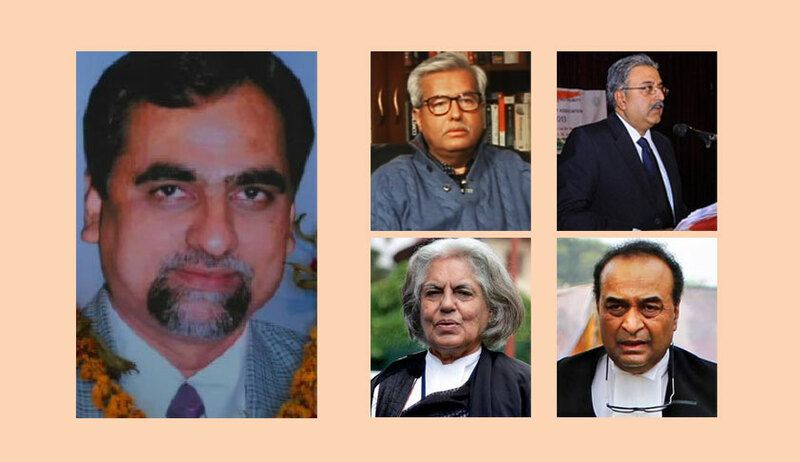 If the other judges were present, Brijgopal Harkrishan Loya would not have been mentioned as ‘Brijmohan’ Loya by Rathi, who claims Loya was a relative of his uncle. Also, Loya allegedly complained of chest pain at 4 AM. Why was he not admitted in a hospital till 6:15 AM? Besides, the claims regarding Dande Hospital are false; there is no mention in that regard. The statement mentions only Meditrina Hospital”. Relying on the statement, Mr. Dave regarded with incredulity that upon being informed of Loya’s death by the doctor at Meditrina Hospital, Rathi insisted on completing formalities and sending the body to his native place Latur as his family was “far”. “How is this possible? Why was the body taken to Latur? Let the state file photographs of Loya at the wedding of Justice Swapna Joshi’s daughter. It is a lie”, he added. “The body was not given to a stranger. After the post mortem, it was carried to his native place in an ambulance accompanied by two other judicial officers”, objected Mr. Rohatgi. “And surprisingly, at Loya’s funeral, Justice Chavan was the only member of the judiciary present”, commented Mr. Dave. “Should the statement of 3 judges and the transfer order of the High Court be dismissed? Are the Chief Justice of the High Court and 5 other judges not telling the truth?”, inquired Mr. Rohatgi. “Of course, the statements should be dismissed. And no judges of the High Court have given statement to the police, they just went to press”, replied Mr. Dave. Referring to the hospital bill, Mr. Dave remarked, “Judge Loya was allegedly brought dead. So how are these expenses under the heads of neurosurgery, critical care medication, diet consultant etc to be explained? These were incurred for a dead man? Loya was never taken there”. “The doctor does not dismiss a patient at the doorstep. The patient is admitted and attempts are made to recessitate. It has been stated that the shock procedure and CPR were performed, a rhythm was acquired but the patient could not be saved”, intervened Mr. Rohatgi. “The name of the person admitting Loya is mentioned as Shrikant Kulkarni. Kulkarni was a colleague of Loya’s and he has stated his relationship with him as ‘friend’? When you subsequently create a document, you write from memory. Also, the time of admission is shown as 6:27 AM, but Loya was said to have been brought dead at 6:15 AM? These are fabricated documents subsequently generated”, Mr. Dave submitted. Upon mention by Mr. Rohatgi that fellow judge Shriram Modak had informed Loya’s wife of his illness at 5 AM, Mr. Dave exclaimed, “Thank you for drawing attention to the wife’s statement. It was procured under pressure. Modak has said in his statement that he does not know who had called Loya’s wife”. “Please speak with judge Loya’s wife, sister, father and son in chambers. If they say they do not want any investigation, that could well be the end of the present petitions”, he added to the bench. Raising doubts on the credibility of the postmortem report in so far as it describe the condition of the body of Loya, Mr. Dave said, “As per the report, the postmortem was conducted at 10:50 AM, four hours after the death. The body should have completely stiff by then”. “And surprisingly, the postmortem dated December 1, 2014 mention the police inquest and report dated December 10 and December 7 respectively”, he added. Senior Counsel Indira Jaising added that there has been overwriting in the postmortem report- “Under December 1, either November 30 or 31 is written”. The bench agreed with her in this behalf. Mr. Dave pointed to the contradictions in the form and the legal notice for the transfer of the body by the same doctor. “Also, the body was forwarded by a Constable of PS Sitapuldi but the postmortem report says PS Sadar”, he continued. “The post-mortem was carried out a government hospital in Sadar. Meditrina Hospital is in Sitapuldi”, retorted Mr. Rohatgi. “The second police station never shows interest in the instance. It is the police station where the murder has happened which actively participates”, commented Mr. Dave. He also submitted that there are no entries in the guestbook of Ravi Bhavan under the name of Loya though the name of every judicial functionary is mentioned in it. “Also why would he sleep in one room with 2 other judges? Surely Justice Swapna Joshi could have made sufficient arrangements?”, he added. “There were 2 beds and 3 people. That sounds strange. But even if it was so, the guestbook records the number of persons separately”, advanced Ms. Jaising. Mr. Dave also questioned the conduct of judge Vijaykumar Barde in so far as he stated that he had met Loya’s wife a few days after the incident. At this point, Justice Chandrachud asked Mr. Dave to not judge the personal view of members of judiciary as each person has a different manner of reaction. However, Justice Chandrachud clarified that he was not suggesting that it was a natural death. “Why were attempts being made to contact friends of Loya at Haji Ali? His phone was accessible. Why did they not contact his wife? Is it in the nature of a wife to not rush the hospital, particularly when there are 3 morning flights to Nagpur?”, Mr. Dave advanced. Based on a letter of the assistant commissioner of police procured in a RTI query, Mr. Dave brought to the attention of the bench that Loya’s security had been withdrawn on November 24, 2014. He cited the judgment in Delhi Judicial Services v. State of Gujarat wherein it was observed that any onslaught on the subordinate judiciary is an attack on the entire institution and not just one man. “Three things important- discharge of Amit shah, the background of case in which charge-sheet was filed and discharge of other police officers, and the transfer of first judge and the death of the second- the matter cannot be thrown out at the first instance”, Mr. Dave concluded. Senior Counsel V. Giri also advanced that Shrikant Kulkarni, who allegedly admitted Loya in the hospital, should have given intimation to the police. He continued that as per the record of the SHO, Dr. Rathi was called to the police station for inquiry, who stated that Loya complained of chest pain at 4 AM and called Rathi. Thereupon, Rathi admitted him at Meditrina Hospital. Mr. Dave suggested that the call of records of Judge Loya be procured. Mr. Giri also prayed that the ECG reports of both hospitals be placed before the bench. “The ECG machine at Dande was allegedly broken. If at all an ECG was carried out, the reports must be produced”, said Mr. Giri. Ms. Jaising also prayed that the register of Ravi Bhavan, the ECG report if any performed and the complete statement of registrar Rathi in which three sentences are missing be filed. Mr. Rohatgi agreed to produce the aforesaid. The matter is scheduled for further hearing on Monday at 2 PM.